Simple instructions on how to make even a 5 gallon hot water tank in an RV, boat or travel trailer last 15 or 20 minutes. Okay so you’ve got yourself an RV or campervan or something right? 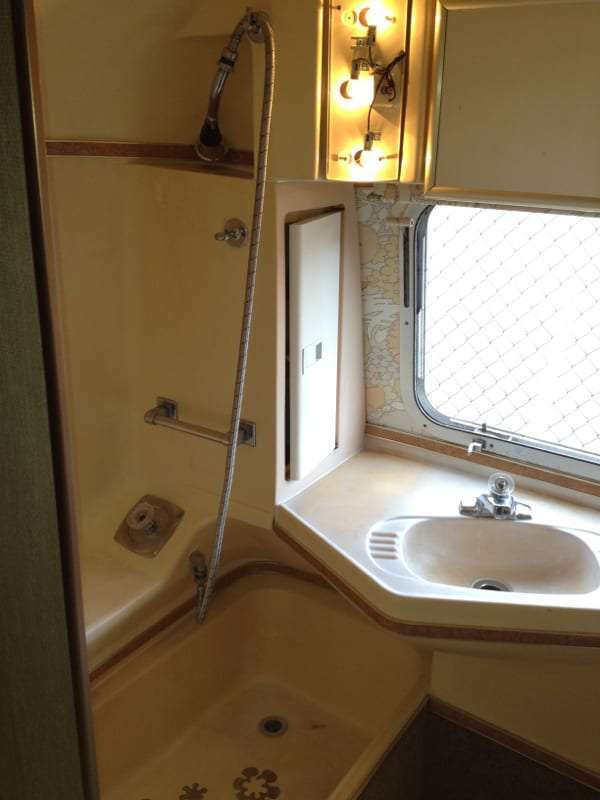 You pop into the shower the morning after your first night on the road…only to realize that that 5 – 15 gallon hot water tank you’ve got onboard only lasts about 2 minutes before you’re all cold water. We just built one for our new Airstream and I thought I’d share exactly how that was done and why you might want to do this. Hint, it’s to save water! Everything on the list can be purchased from your local hardware store, or an Ace or Home Depot. Low Flow Shower Head, preferably at 1 gallon per minute (gpm). 4 to 5′ of hose or shower hose. I used some nice steel hose that was originally intended for a washing machine, and then purchased adapters to get the 3/4″ hose to fit on the smaller pipe size of showers and shower heads. I went this route because a) I couldn’t find any hose shorter than 8′ that was intended for this purpose and b) I really liked the look of the washing machine hose I purchased. Optionally, a 6″ or so piece of chrome pipe, preferably bent at about a 45 degree angle. Wrap the nozzle of your shower’s faucet in plumbers tape. One go around should do the trick. Then screw your hose onto the nozzle, right over the plumber’s tape. This will ensure that you don’t have any leaks. 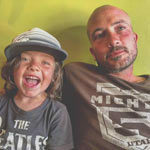 Considering our entire goal here is to make the most of a small hot water tank, this is an essential step. The low flow shower head I purchased was essentially just the head, no handle or anything, which is why I bought my own 6″ angled chrome pipe: to serve as the handle. Again, wrapping the pipe at both ends with plumber’s tape, attach it to your hose. 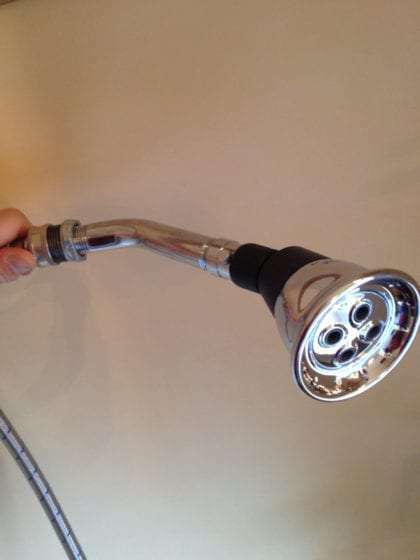 Go ahead and attach your shower head to the pipe (or if yours already had a handle and your forewent the pipe, directly to the hose. Now, you’ve got a shower head that will only use 1 to 1.5 gallons per minute. If you’ve got a 5 gallon hot water tank, that means you will essentially get around 7 – 14 minutes of shower time (since you won’t be using 100% hot water, assuming your hot water tank heats the water up nice and hot). 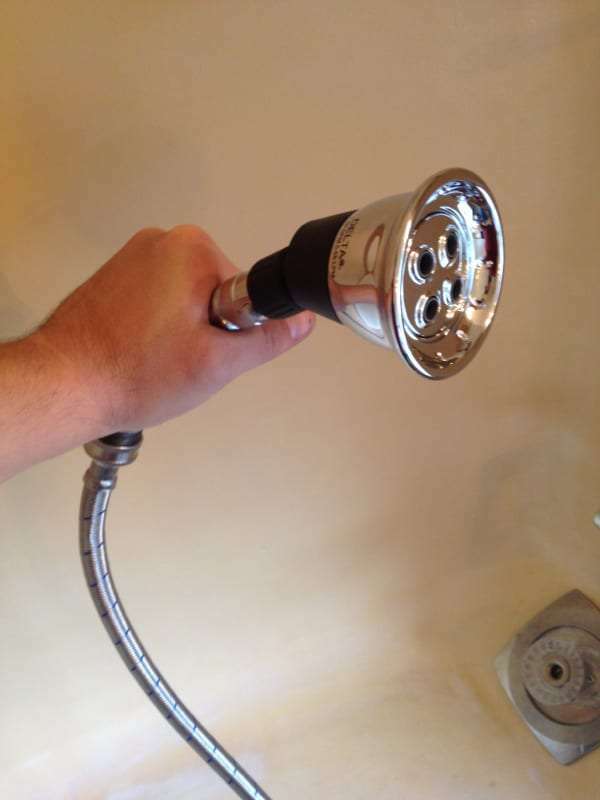 I actually had one more piece which I used, an on / off switch which attaches between the hose and the handle of your shower head. It’s a simple little device that simply closes off the water to the shower head’s opening, but unlike turning the water off completely, you won’t have to wait for it to warm back up or get a shot or two of cold water as you turn it back on. Why would this matter? Because even 14 minutes isn’t all that much time to shower, and even if it is, wouldn’t it be great if you could split that 14 minutes across two people? When showering in an RV or boat, you can actually make 14 minutes of water time work out into half an hour or more worth of water. Simply fire up your shower and get yourself wet. Flip the switch to prevent the water from coming out of the shower head, and soap up. When you’re ready to rinse off, flip the switch back and hose yourself down. Since you’re using a flexible shower head, you can hit all of the soapy spots a lot more quickly and thus spread those valuable minutes of hot water out over more than just your own personal (greedy!) shower. Amaze your friends, impress your girlfriend, clean all of your children in one day!